Spiral binding. PMIC's CPT book includes all 2019 CPT codes and full descriptions with all official code notes. Published exactly like the AMA CPT book, and loaded with extra features designed to improve the accuracy of your procedure coding. Value Priced CPT 2019 Code Book in Spiral Format! PMIC now offers its famous CPT Plus coding book in spiral format! If you like to fold your code books in half to save desk space, choose this spiral bound version. 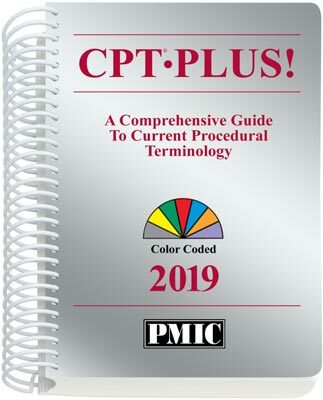 PMIC's best-selling CPT coding book includes all 7,000+ official CPT 2019 codes and full descriptions, coding instructions, and parenthetical notes, exactly as published by the AMA. This CPT book is loaded with extra features designed to improve the accuracy of your CPT procedure coding. Comprehensive CPT Coding Instructions: includes PMIC's complete CPT coding tutorial packed with general instructions and coding and billing tips. Full-color Anatomical Illustrations: includes unique, full-color, full page anatomical illustrations with CPT code section cross-references. Unique CPT Color-Coding System: features the same color-coding system as PMIC's ICD-9-CM and HCPCS coding books to clearly identify CPT codes subject to special coding rules, coverage limitations, and payment restrictions. This unique color-coding system will help you code procedures faster and more accurately, while decreasing your audit liability and potentially increasing your revenues. Compact Size Larger Print, Light-Weight: The compact 6" x 9" format takes up 40% less desk space, weighs half as much as other books, and features a single column format with larger, easier-to-read print. Thumb-indexing and Spiral Binding: thumb-indexed to help you locate CPT codes faster, and spiral bound so the book stays open exactly where you want it to. New and Improved Alphabetical Index: PMIC's completely revised index has over twice the page count and over four times as many listings as the previous edition, designed to help you locate codes faster.